The Control Master is designed especially for precise sanding and finishing of particleboard and MDF panels. The Control Master Sander is capable of high production, fine finishing and holding close tolerances. The Control Master is available in 4' to 9'-6" widths and can be equipped with a variety of head styles, depending upon the specific application such as the type of panels, stock removals, feed speed and finishes required. One of the keys to accurate and precise sanding is Kimwood's patented "orifice" sanding feature which is used on the Kimwood Control Master Sander. Because of the tremendous pressures created across the face of panels while being sanded, it is important that the design of the sander include a controlled orifice (opening) through which the panel must pass. Not only is the creation of the opening important, but also the maintaining of the opening under actual sanding load is equally important. 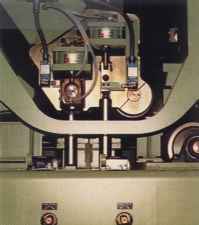 The actual orifice is created and maintained utilizing air cylinders, adjustable columns and slide blocks which all comprise the actual sanding head assembly. The tracking cylinder causes the tracking roll to pivot on its axis in short intervals resulting in an easy oscillation of the sanding belt. By adjusting the stroke limiting knobs, the operator can change the rate of speed that the belt drifts, making sure the tracking roll is steering sufficiently. 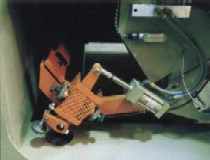 The tracking cam adjustment is designed so the operator can rotate the cam while the machine is running allowing tracking abrasive belts easier.